Hey Loveland, Colorado! Get ready for a new brewery coming to your town! The rumor mill has been buzzing lately and now official word has come down about a new brewery being planned for next year (2010). Two local homebrewers are planning to open the Grimm Brothers Brewhouse and specialize in German-style lagers and ales. According to an article in the Loveland Reporter-Herald on November 10, 2009, two friends Don Chapman and Aaron Heaton are planning to take their love of German beer and open up their own brewery. Chapman and Heaton met through attending meetings of the Liquid Poets Society, a Fort Collins based homebrew club. These guys are currently brewing beer and refining their initial brews at Chapman's home in Loveland. The Grimm Brothers Brewhouse would be Loveland's second operating brewery / brewpub after the current Rock Bottom Brewery at the Centerra Shops. The Golden Key - a traditional German Pilsner. The 13th Door - a dark Munich Dunkel. Big Bad Wolf - a hoppy American Red. Seven Eighths - a German Roggenbier made from rye. Old Rinkrank - a malty German Bock beer. Chapman and Heaton are planning to open up a brewhouse in downtown Loveland sometime in the first half of 2010. No word on what the final address will be yet. Grimm Brothers Brewhouse will try to fill the gap of a lack of good German-style beers in the area when they open. They plan on hosting a beer tasting on Tuesday, November 17th from 8pm to 9:30pm at the Pourhouse Bar and Grill in Loveland at 124 East Fourth Street. You can get a chance to sample some of their upcoming beers and pair it with German food. Update: The original logo design was replaced by another one just before they opened in 2010. These 5 original beers were eventually replaced with other beers: Little Red Cap, Snow Drop, Master Thief, The Griffin, and The Fearless Youth. 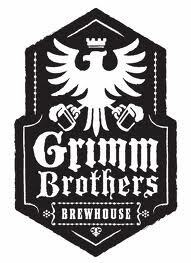 Visit their new website at: www.grimmbrosbrewhouse.com or contact them at: info@GrimmBrosBrewhouse.com. Become their fan on Facebook. - A taste of Rock Bottom Centerra. - Nick's (LiquorMax) 10-hour birthday beer tasting. - Return to Choice City with Muckney Brewing.